3. To change your EZ username, click in the left menu (under account summary), type your new EZ username and your EZ password, then click "save." A green bar confirming the change appears at the top of the screen for just a few moments before it disappears. 3b. A green bar appears at the top of the screen for just a few moments before disappearing. 3c. Check your email account for your new password (and check your spam folder too, if the info is not in your inbox). 4. 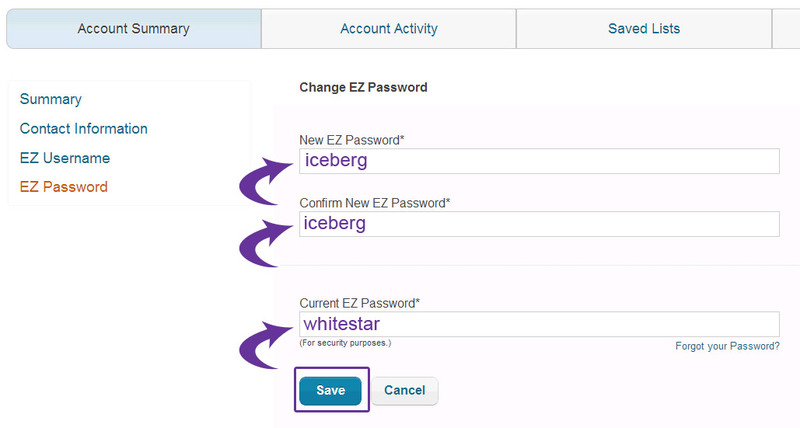 To change your EZ password, click in the left menu (under account summary), type your new EZ password, type it again to confirm, type your current EZ password and then click "save." A green bar confirming the change appears at the top of the screen for just a few moments before it disappears.